It’s a tale of two islands as our small group journeys from New Zealand’s North to its South, through lively cities and pristine fjords, past lush farmland and enchanted forests in a land where the outdoors is the national shrine. 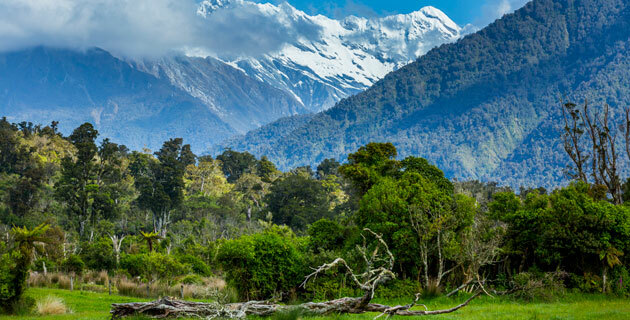 Add engaging “Kiwis” and intriguing indigenous cultures – it’s a pure New Zealand experience. Please call if your city is not listed or for land only prices. Prices are per person based on double occupancy and include airline taxes, surcharges, and fees of $279, which are subject to change until final payment has been made. Located just steps from Lake Rotorua and a short walk from the city center, the Millennium Hotel Rotorua offers an ideal home base from which to explore this vibrant small city. Amenities of this 227-room hotel include a restaurant, bar, pool, fitness center, laundry and dry cleaning service, and Wi-Fi internet access (for a fee). Air-conditioned guest rooms feature private bath with hair dryer, minibar, and TV. Scenic Hotel Te Pania enjoys an ideal location on the edge of stunning Hawke’s Bay, and a short walk from Napier’s Art Deco city center. The hotel’s amenities include a restaurant and bar, fitness center, self-serve laundry, valet laundry service (available five days/week), and complimentary Wi-Fi internet access. Each of the 109 air-conditioned guest rooms faces out towards Hawke’s Bay and includes private bath with hairdryer, minibar, tea- and coffee-making facilities, TV, and phone. Conveniently located in the heart of Wellington, the Bolton Hotel sits within walking distance of the cable car, Museum of New Zealand, Wellington Botanic Garden, and the picturesque waterfront, with great restaurants and shopping close at hand. Amenities include a restaurant, fitness center, heated lap pool, spa, sauna, laundry and dry cleaning services, and complimentary Wi-Fi internet access. Each of the 134 air-conditioned guest rooms has private bath with hair dryer, minibar, TV, and an in-room iPad Mini for room service. Completely rebuilt after several earthquakes, the Rydges Latimer Square reopened in 2013. The 138-room hotel’s amenities include a restaurant and a bar/lounge, fitness center, and sauna. Air-conditioned guest rooms have private bath with hairdryer, complimentary Wi-Fi internet access, in-room safe, coffee- and tea-making facilities, minibar, ironing facilities, TV, and phone. Situated on the edge of Westland Tai Poutini National Park, Scenic Hotel Franz Josef Glacier is located just a few minutes from the glacier from which it takes its name. Hotel amenities include two restaurants, a bar, self-serve laundry, full spa with massage services (located a two-minute walk from the hotel), hot tub, and complimentary Wi-Fi internet access. Air-conditioned guest rooms have private bath with hairdryer, tea- and coffee-making facilities, TV, and phone. The Millennium Hotel Queenstown sits on a hill in Queenstown, just minutes away from the town’s central shopping district. Amenities include a restaurant, bar, fitness center, sauna, spa, and Wi-Fi internet access (for a fee). Each of the 220 air-conditioned guest rooms has private bath with hair dryer, minibar, safe, tea- and coffee-making facilities, TV, and phone. In this endearing, offbeat memoir, Christina Thompson effortlessly alternates tales of mostly disastrous early encounters with the Maori (she’s an anthropologist) and the story of the love of her life, Seven, the Maori she married. Her title is taken from what “Darwin said that Cook said the Maoris said at that interesting moment when Europeans first appeared.” What probably actually transpired on that fateful day in 1769 at the Bay of Isles was more complex. This superb illustrated guide to New Zealand from the Eyewitness series features color photography, dozens of excellent local maps and a region-by-region synopsis of the country’s attractions. Handsome, convenient and up-to-date, this is the guide to carry. Take this book with you on your trip to help you untangle the sometimes perplexing and colorful local idioms. A guide to the Maori language, written for the traveler looking for an introductory foundation to the language, culture and traditions of the Maori people. Pulitzer Prize-winner Fischer compares the politics of America and New Zealand, posing the question: is it possible to be both fair and free? Despite its focus on politics and fairness, the book is thoroughly enjoyable and, in its own way, a travelogue. A new unabridged edition of the classic illustrated sourcebook on Maori tattooing (moko), first published in 1896. The author pays scrupulous attention to the intricate patterns, design and cultural meaning of traditional Maori tattoos. This engaging scholarly work explores New Zealanders’ relationship with native fauna: how New Zealanders have nurtured, glorified, cherished, demonized and devoured the nation’s animals. McLynn re-creates the remarkable voyages that took the famous navigator from his native England to the remote Pacific, showing him to be a brave and brilliant seaman, who transcended his humble beginnings as a deckhand and triumphed through courage, talent and good fortune. Butler’s classic Victorian novel inspired by his experiences in 1860s New Zealand. A satirical account of a journey to an upside-down country at the end of the world, where sick people are thrown in jail and murderers are taken to the hospital. Originally published in 2002, this sensuous novel is set in rural New Zealand and spans the end of World War I to the present day. Brought together by their obsession with the tango, two couples experience the trials of true love and the power of storytelling. The three marvelous, long stories in this collection constitute the beginnings of a novel based on Mansfield’s childhood in Wellington. Murder and mystery in 19th-century New Zealand. This epic and intricately constructed tale — spinning out over 800 pages — is set during the wild days of the 1866 gold rush on the west coast on South Island. It’s just over Arthur’s Pass from where Catton was raised in Christchurch. First published in 1921, this loving account of the ecology of New Zealand focuses on Guthrie-Smith’s 40,000-sheep shearing station on the shores of Lake Tutira in the Hawke’s Bay region of the North Island. A comprehensive and compact guide by longtime resident Julian Fitter featuring 600 color photographs, range maps and species descriptions. In the trademark graphic Eyewitness style, this sturdy guidebook colorfully describes the world’s cetaceans with numerous illustrations, range maps, fluke drawings and a few paragraphs on each species.